In hyperbaric oxygen therapy, a patient spends about an hour in a pressurized chamber breathing 100 percent oxygen to promote the growth of blood vessels and improve the healing process. Without the many hours he spent sitting inside a submarine-like oxygen chamber in Spokane Valley, North Idaho resident Nick Maniscalco doubts his long recovery from a traumatic brain injury would have been as successful as it has. And Holly Dodge, a Post Falls woman who has a variety of debilitating syndromes, said high-pressure oxygen therapy rid her of bad headaches and improved her mobility. Both of them went through a series of treatments at Spokane Hyperbaric Center, and Idaho Medicaid reimbursed the business for a portion of their bills. Maniscalco and Dodge were among 26 Idaho residents whose “off-label” treatments there in 2010 and 2011 were partially paid by Medicaid, the government health insurance program for low-income and disabled people. But the conditions of those 26 patients were not on the approved list of illnesses and injuries for which Medicare and Medicaid reimburse hyperbaric oxygen therapy providers. The Idaho Department of Health and Welfare says Spokane Hyperbaric must refund about $250,000 in Medicaid reimbursements and pay a $50,000 civil penalty. The business – one of just two places offering hyperbaric oxygen therapy in the Spokane-Coeur d’Alene area – is appealing the agency’s order. Idaho’s claims processing agent, Molina Medicaid Solutions, approved all of the contested reimbursements, contends Al Griffone, the clinic’s owner. The alleged payment errors coincide with Molina stepping in as the Idaho Medicaid contractor in 2010 and fumbling the switch to the state’s new claims processing system. The resulting payment delays and errors affecting thousands of providers prompted a personal visit and apology from Dr. Mario Molina, CEO of the Long Beach, California-based company. Griffone blames Molina for the billing mess that has enveloped his business for the past three years, and which he fears will force him to close the clinic on East Mission Avenue. The state maintains Spokane Hyperbaric is at fault, even though the claims were processed and paid through Molina. No Health and Welfare representative or contractor gave prior approval of the services in question, Idaho Deputy Attorney General Whitaker Riggs has argued in the case. The services were billed contrary to department rules and to Spokane Hyperbaric’s provider agreement with Idaho Medicaid, Riggs asserted. Health and Welfare wouldn’t answer questions about the dispute, and Molina has refused to meet with Griffone’s attorney to try to resolve it. Idaho also has threatened to terminate Spokane Hyperbaric as a Medicaid provider. The treatment usually is repeated daily for several weeks. For decades, the list of conditions that insurance covers for this therapy has changed little. It includes decompression illness, crush injuries, diabetic wounds, tissue damage from cancer radiation treatment, carbon monoxide poisoning and 10 other conditions. The therapy has grown in popularity for a host of other conditions, including autism, cerebral palsy, stroke, fibromyalgia, Parkinson’s disease and rheumatoid arthritis. Such experimental treatments are not approved by the Food and Drug Administration and generally are not covered by insurance, including Medicare and Medicaid. That’s why Griffone was surprised when a patient came in saying Idaho had green-lighted the therapy for one of the conditions not on the approved list. In each case, Griffone said, the patient first called Idaho Medicaid to obtain approval, and Spokane Hyperbaric followed up with a second call to verify it. “So, after a while, we would just submit it to the state of Idaho and they would pay it,” he said. Maniscalco, the traumatic brain injury patient, said the Medicaid coverage was the only way he was able to give hyperbaric therapy a try. When Maniscalco was 19 he was in a car wreck that nearly took his life. It was a Sunday morning in January 2008, and he was driving home from Walla Walla when he hit a patch of ice and smashed into a parked heavy equipment trailer. The athletic and outgoing teen suffered a traumatic brain injury. He spent three months in a coma and another five months in acute care. He learned to eat, talk and walk again, progressing from a wheelchair to a walker to a cane. He spent a full year walking 1 mile a day, then took to a stationary bike and pedaled 1,800 miles in six months. Maniscalco graduated from a small-engine mechanic program at North Idaho College in 2011 and continues to take classes at the community college. He’d like to become a helicopter pilot one day, though he’s on seizure medication that prohibits him from flying for now. 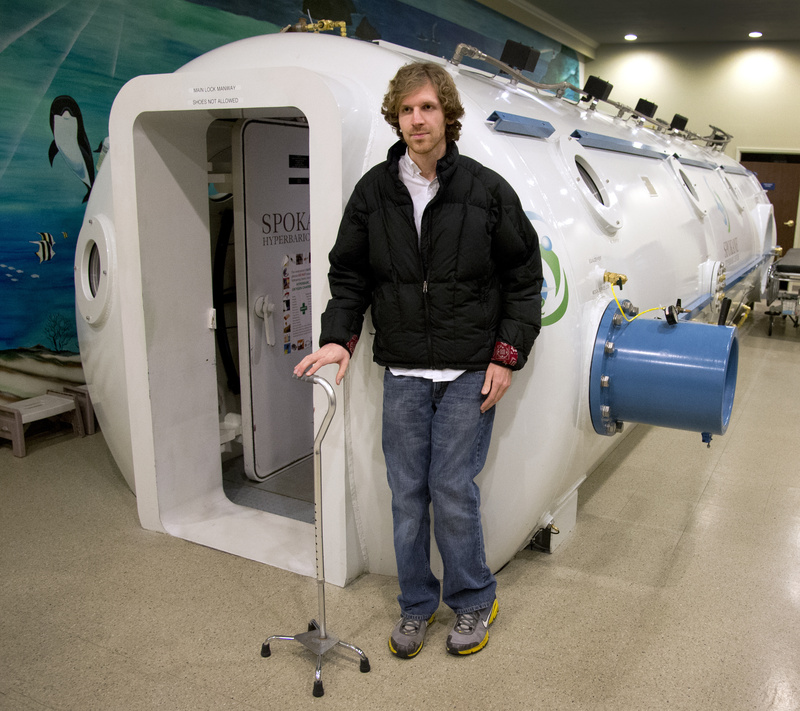 He went for 112 “dives” in Griffone’s 30-foot-long, 16-person hyperbaric chamber. Maniscalco said he didn’t notice immediate results but that others saw his balance improve. Then he began to see progress that he attributes to the oxygen therapy. Dodge went in for almost 50 treatments in search of relief from fibromyalgia, arthritis and migraines. She said she saw results after a couple of weeks. At first, she rode the bus to the clinic, then found she could drive herself without being in pain. She and Maniscalco said they’d still be going in for oxygen therapy if Medicaid subsidized the cost – about $350 per treatment. In late 2011, two women from the Idaho Department of Health and Welfare showed up at Spokane Hyperbaric. They said they were there for a routine audit and asked to see patient records. The women returned and said they had lost all of the data in a computer crash and asked to rescan the records, he said. In March 2012, Griffone and his business partner David Hensel received a letter from Idaho demanding the Medicaid refund and informing them of the penalty. “They said, well, we’re sorry but you’ve been treating conditions that are off-label, and you were overpaid and we want the money back,” Griffone said. “We had followed all the rules, all the regulations. We had called every number we could possibly call” to verify the treatments would be covered, he said. The claims were processed around the time of Molina’s shaky debut as Idaho’s Medicaid billing contractor in June 2010 and the launch that July of a $106 million claims processing system. Providers soon complained of thousands of claims that were denied, delayed or incorrectly processed, leading the Idaho Office of Performance Evaluation to investigate. In a March 2011 report to the Legislature, Rakesh Mohan, director of the evaluation office, said most of the issues could have been avoided with more pilot testing of the new processing system and better quality assurance measures in Health and Welfare’s contract with Molina. In its contacts with Molina, Spokane Hyperbaric provided the required information on each procedure to confirm that Idaho Medicaid would cover the treatment, said Starr Kelso, a Coeur d’Alene attorney defending the clinic. “So for every patient, Spokane Hyperbaric got pre-approval from Molina,” Kelso said. Molina “reviewed all the policies, all the rules and all the regulations in the database of Idaho Medicaid and determined there was no reason it shouldn’t be paid,” he said. Riggs, the state’s attorney, maintains that Spokane Hyperbaric’s contacts with Molina only went as far as to verify the validity of procedure and diagnosis codes, to confirm that hyperbaric oxygen therapy is not generally subject to Medicaid’s prior authorization process, and to confirm there was no limit on how often the codes could be billed. The Spokane Valley provider failed to ask the “critical question” of whether the therapy was “billable for the injuries and conditions for which it was provided,” Riggs wrote in a 2013 filing. “No request for a focused case review … was made, and no approval for the services was ever provided, whether ‘prior’ or otherwise,” he wrote. Since then, the case has lumbered through the administrative appeal process. Testimony before a hearings officer began last fall and has yet to resume. Whoever loses then could appeal in District Court. Hensel, who co-founded the clinic with Griffone in 2007, died in August 2013, leaving Griffone to carry on the battle at a time he’d prefer to be thinking about retirement and focusing on mission work he and his wife volunteer for in other countries.